Episode 118: What is an Inbound Content Strategy? An inbound content strategy is so much more than just churning out feature or product-based copy and sticking it on your website. An inbound content strategy understands and accommodates your personas and every stage of the buyer journey. Great content speaks directly to your prospects, answering their questions and helping them make decisions. 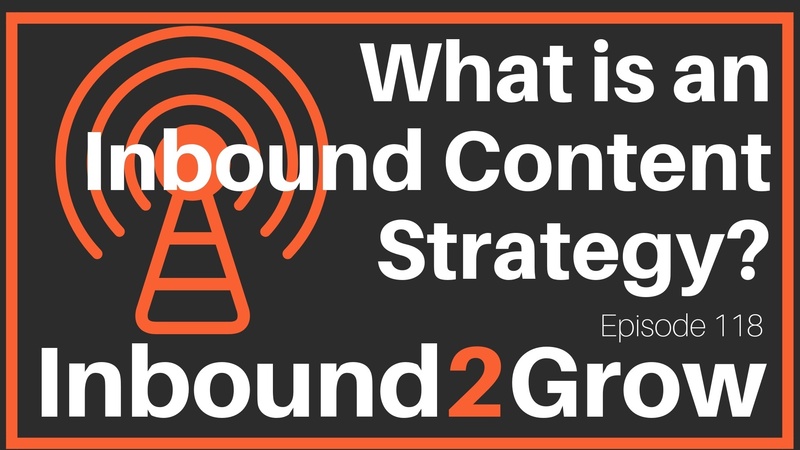 [0:43] Question: What is an Inbound Content Strategy? B2B, B2C, doesn’t matter, everyone uses the internet to help them make decisions, find information, solve problems, and make purchases both big and small. Your content is often the first interaction a prospect has with your brand. In many ways, your content is your brand. The content that you create builds your brand, establishes your credibility, and creates awareness. Your inbound content strategy then is how you will create relevant, helpful content for every step of the buyer journey that answers your prospects questions, solves their problems, and helps them make decisions. There is no one kind of content that is best or right. The idea that content is a specific thing (an e-book for example) is a reliance on tactics rather than strategy. Part of your strategy is figuring out the types of content your prospects want and need. That could mean creating videos, FAQ’s, infographics, presentations, webinars, blog articles, or any format that fits and works for your prospects because your content is your expertise communicated in a way that your prospects want to consume. If you struggle with creating content, then you need to do a better job of understanding your persona. Who are you trying to talk to? What are their questions? What problems are they trying to solve? Great content ideas can come from your existing customers, your salespeople, and your customer service people. Do sales and customer service get the same ten questions? Take those questions and turn them into content. Your content strategy should be creating customer-centric content that is mapped to every stage of the buyer journey and formatted in whatever way works best for your persona. Lean into quality. Be smart and strategic in providing what your customers want and need. Leaders leave content to marketers at their own peril. Everyone has a stake in your organizations content and should contribute. Don’t forget goals! Leaders should ensure that every piece of content has goals that can be measured. Audit your content. Is it focused on your buyers or your products? Map your content to the buyer journey and set goals for each stage and asset. Ask your customers questions and create content around the answers. Curious where Todd and Dan got their statistics for this show? Here are some of the stats and their sources. 70% of YouTube viewers watch videos for "help with a problem" they're having in their hobby, studies, or job – Why You Should Lean Into How-to-Content in 2018 2and2/Google, “The Values of YouTube” Study, Oct. 2017 (n of 1,006 consumers between the ages of 18-54, with 918 monthly YouTube users).